"Discover Chocolove premium Belgian chocolate. 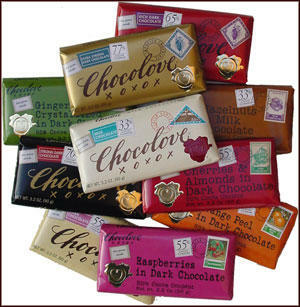 Available in ten distinct flavors that range from a sweet, creamy Milk Chocolate with a 33% cocoa content up to Extra Strong Dark with an impressively strong yet smooth 77% cocoa content. The cocoa content is boldly indicated on each bar for easy identification." The whole "love" angle is a bit too gimicky for my taste. But the "Orange Peel in Dark Chocolate" bar suits my tastes perfectly. And I have a deli at the bottom of two flights of stairs that sells this stuff 24/7. Found the link at Cool Hunting. Found the chocolate in Park Slope, Brooklyn.